One wouldn’t necessarily think that there was a parallel between the historical lives of diaconal ministers and those of artists. Yet Terrie Chedore found one, which she explores in her latest solo exhibit, Whispers in the Sand: a brief history of diaconal ministry, currently on display at Galerie du Séminaire at The United Theological College in Montreal. The exhibit encapsulates six key periods in the history of Diaconal Ministry. The icon-like images were originally developed for a ‘work of art integrative theology paper,’ a final requirement for a degree in Diaconal Ministry. In her paper, Colouring Outside the Lines: Parallels in the Histories of Diaconal Ministry and Religious Art, Chedore explores “the complex and confusing history of diaconal ministry through the eyes of theologians, artists, art therapists and historians”. She then incorporated seashells, sand and sunlight in a Zen-like process to symbolically work through her own doubts and fears while spiritually breathing life into each character and revealing new aspects of diaconal ministry. Like any creative process, the icons emerged randomly following Chedore’s healing journey rather than any logical, historical pattern. First came the flames of fire searing through her pain; then the Christ icon forced a re-visualization of her own Christology; the Phoebe image affirmed her call to a role as diaconal artist; the Secular Deacons reinforced the diversity of diaconal ministry; the 19th century Deaconess allowed her to release her sadness; and finally, the two Deacons propelled her in a new direction). An addition to the exhibit, Jesus Cloaked in Mystery, representing Jesus preparing to wash the feet of the disciples, was not included in the integrative paper. The thesis was pivotal in Chedore’s decision to continue her journey as a diaconal artist. This current art exhibit, just months after being approved for commissioning in the UCC as a diaconal minister, is an affirmation of her call to diaconal ministry. 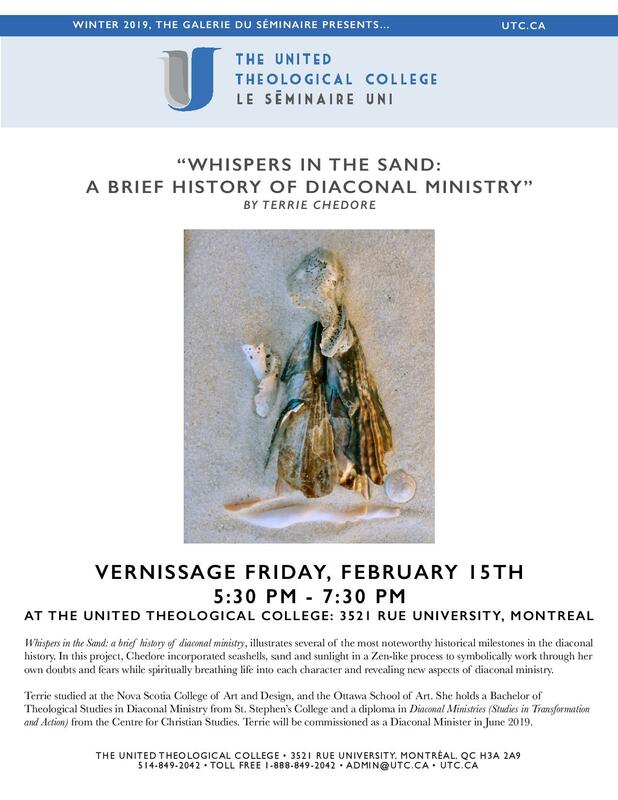 La Galerie du Séminaire warmly invites you to a vernissage featuring the artwork of Terrie Chedore: “Whispers in the Sand: A brief history of diaconal ministry”. The vernissage will take place from 5:30 PM – 7:30 PM on Friday, February 15th at the United Theological College in Montreal. Terrie Chedore, a diaconal artist, studied at the Nova Scotia College of Art and Design, and the Ottawa School of Art. She holds a Bachelor of Theological Studies in Diaconal Ministry from St. Stephen’s College and a diploma in Diaconal Ministries (Studies in Transformation and Action) from the Centre for Christian Studies. Terrie will be commissioned as a Diaconal Minister in June 2019. Thanks, Mom. I sent you pictures from the Vernisage. Good to hear from you, Loretta! Thank you! Congratulations Terrie, So very proud of you. Thank you, Audrey! It’s been a journey, that’s for sure! How kind of her to share the news. Thank you for your encouragements! Hi there, its pleasant post about media print, we all be familiar with media is a great source of data. Thank you, Annette! I hadn’t thought of a tour. That might be a possibility if you have a venue. It would be good to reconnect. So inspiring! We are often called to ministry outside the box. You are expressing your call and your ongoing journey in your own unique way. In doing so, may this also inspire and encourage others. With gratitude. Much appreciated, Barbara! I finally found a way to tie Diaconal Ministry and art together in a meaningful way. Blessed be.